Gemzar is indicated in combination with cisplatin for the first-line treatment of patients with inoperable, locally advanced (Stage IIIA or IIIB) or metastatic (Stage IV) non-small cell lung cancer. It is also indicated as first-line treatment for patients with locally advanced (nonresectable Stage II or Stage III) or metastatic (Stage IV) adenocarcinoma of the pancreas. Gemzar is indicated for patients previously treated with 5-FU. 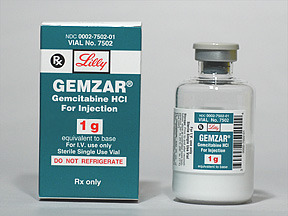 Gemzar infusion contains the active ingredient gemcitabine, which is a type of chemotherapy medicine for cancer known as a 'cytotoxic antimetabolite'. Gemcitabine is a chemotherapy drug that is given as a treatment for some types of cancer. It is most commonly used to treat non-small cell lung cancer, pancreatic, bladder and breast cancer. This information describes gemcitabine, how it is given and some of its possible side effects. It should ideally be read with our general information about chemotherapy and about your type of cancer, which give more information and advice. Gemcitabine is used alone or with other treatments/medications to treat certain types of cancer (including breast, lung, ovarian, pancreatic). It is a chemotherapy drug that works by slowing or stopping the growth of cancer cells.